In In re I.AM.SYMBOLIC, LLC, [2016-1507, 2016-1508, 2016-1509] (August 8, 2017), the Federal Circuit affirmed the decision of the TTAB affirming the Trademark Examiner’s refusal of registration of the mark I AM on grounds of likelihood of confusion. After initial refusals of registration of the I AM mark in Classes 3, 9, and 14, I AM SYMBOLIC amended its description of goods to include the limitation that the goods were “associated with William Adams, professionally known as ‘will.i.am.’” The Examiner maintained the refusal, and the Board affirmed, noting “we do not see the language as imposing a meaningful limitation on [Symbolic’s] goods in any fashion, most especially with respect to either trade channels or class of purchasers. Before the Federal Circuit I AM SYMBOLIC argued Symbolic argues that the Board erred in its likelihood of confusion analysis by: (1) holding that the will.i.am restriction is “precatory” and “meaningless” and therefore not considering it in analyzing certain DuPont factors; (2) ignoring third-party use and the peaceful coexistence on the primary and supplemental registers and in the marketplace of other I AM marks; and (3) finding a likelihood of reverse confusion. Regarding the will.i.am restriction, the Federal Circuit said I AM SYMBOLIC failed to show that the Board erred in finding that the restriction does not impose a meaningful limitation in this case for purposes of likelihood of confusion analysis. Under a proper analysis of the du Pont factors, the goods are identical or related and the channels of trade are identical, and thus there is a likelihood of confusion. The Federal Circuit agreed with the Board that the purported restriction does not (1) limit the goods “with respect to either trade channels or class of purchasers”; (2) “alter the nature of the goods identified”; or (3) “represent that the goods will be marketed in any particular, limited way, through any particular, limited trade channels, or to any particular class of customers.” In the absence of meaningful limitations in either the application or the cited registrations, the Board properly presumed that the goods travel through all usual channels of trade and are offered to all normal potential purchasers. Regarding other I AM marks, the Federal Circuit rejected the argument that because applicant’s class 25 registration had co-existed with the cited class 3, 9 and 14 registrations that there was no likelihood of confusion. The ownership of a registraiton on one class does not give a right to register the same]mark on an expanded line of goods, where the use of the mark covered by such registration would lead to a likelihood of confusion, mistake or deception. failing to specifically analyze the potential weakness of registrants’ marks based on limited third-party use. Regarding the alleged finding of “reverse confusion,” the Federal Circuit attributed the Board’s comments to a response to the arguments about the fame of the applicant being insufficient, not to an express finding of reverse confusion. Overall, the Federal Circuit found sufficient evidence to support the Board’s finding I.AM confusingly similar to the cited registrations, and sustain the refusal of registered. Bojangles International LLC originator of the Cajun Filet Biscuit that it promotes with the jingle “GottaWannaNeedaGettaHava” has sued Hardees for selling a Cajun Chicken Biscuit and using the phrase GottaWannaNeedaGettaHava to do so. 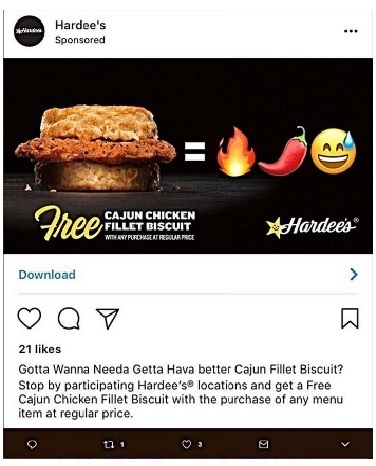 Hardees introduced its Cajun Fillet Biscuit via Twitter, and promptly received a cease and desist letter which prompted Hardess to rename its sandwich Cajun Chicken Biscuit. This was not enough to appease Bojangles, which brought suit in North Carolina, alleging that Cajun Chicken Biscuit infringes its federally registered Cajun Fillet Biscuit trademark, and that Hardee’s introductory Tweet infringed its federally registered GottaWannaNeedaGettaHava trademark. It is a curious case because while Hardess indisputably used the phrase GottaWannaNeedaGettaHava in its tweet but not as a brand name, and arguably as a comparative reference to Bojangles’ arguing that its Cajun Fillet Biscuit is “better.” Would someone receiving this Tweet from Hardees really be confused? Hardees started out using the Cajun Fillet Biscuit trademark, but quickly switched to Cajun Chicken Biscuit. What would Bojangles expect Hardees to call a Cajun flavored chicken biscuit? The case will test the limits of 15 U.S.C. § 1115(b)(4) defense for uses “otherwise than as a mark . . . which is descriptive of and used fairly and in good faith only to describe the goods or services.” Hardees will likely argue its use “GottaWannaNeedaGettaHava” was a comparative reference to Bojangles, and its use of Cajun Chicken Biscuit is descriptive of its product. It will be interesting to see if Bojangles can make Hardees dance. Montauk claims that it began selling the UNICORN LATTE in December 2016 (although their trademark application claims a first use of October 1, 2016. 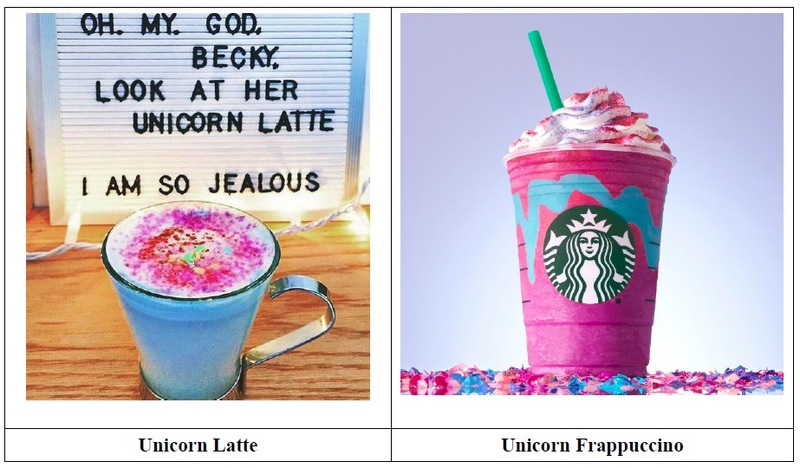 Peculiarly, Montauk acknowledges that the Unicorn Latte fits with the current trend of colorful foods—a relatively recent interest, particularly on the Internet, with multi-colored foods, and even specifically identifies UNICORN NOODLES and UNICORN POOP. The Eagles have sued Hotel California Baja, LLC, in the Central District of California [2:17-cv-03276] for trademark infringement. Hotel California Baja owns a small hotel in Todos Santos, Mexico that opened in 1950 under the name Hotel California, but subsequently went through a number of name changes over the years. The Eagles allege that to revitalize the hotel and create a reputation for it,the hotel has promoted a reputed, but false, connection to the Hotel in the famous Eagles song. The Eagles complain that defendant runs a merchandising operation that manufactures and sells a wide variety of clothing and other merchandise featuring their HOTEL CALIFORNIA mark. There’s not much chance that the Eagle will Take it Easy on this one. In Oaklawn Jockety Club, Inc. v. Kentucky_Downs, LLC, [16-5582] (Sixth Circuit April 19, 2017), the Sixth Circuit affirmed a district court dismissal of plaintiff’s trademark infringement action because defendant’s use of plaintiffs’ trademarks in its electronic horse racing games was not likely to cause confusion. 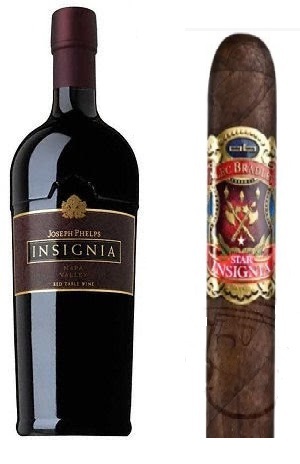 Although the case was designated “NOT RECOMMENDED FOR PUBLICATION,” it makes an important point about trademark infringement: defendant must use plaintiff’s trademark as a trademark. 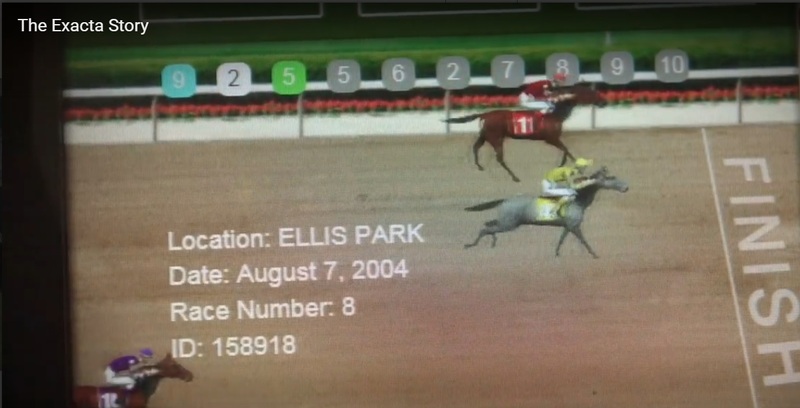 The district court found, and the Sixth Circuit agreed, that defendant’s marks in its animated video recreations of actual historic horse races, in order to identify the location of the race, was not a trademark use. manner and does not cause a likelihood of confusion as to the source of the video. The Sixth Circuit added that the fact that the replay is entirely generic and does not visually depict the plaintiffs’ facilities further supports this conclusion.